A few eyebrows were raised earlier in the season when it became known that I planned to submit an entry for the World Championship Grand Prix at Solitude and some of the Circus paddock regulars, appeared to go into a state of near shock when they discovered my entries for the 125 and 250 races, had been accepted. Arriving at the circuit early in the morning on the 16th July, a day before the start of practice, I began to think that perhaps we had been a little over confident and/or had Solitude 250 Parilla given the impression that we were naive in expecting to qualify my Parillas at this meeting. Hailwood, Redman, Read, Anderson, Taveri, Provini, Deubel/Horna, Scheider, Shepherd, Duff, Beal, Robb, Bryans and a young Italian by the name of Giacomo Agostini, were just some off the ever ending list of top Works Riders we found encamped in their caravans and transporters in the paddock. Comments from some of the old wags in the scrutineering bay along the lines of, “are you sure you are at the right meeting” and “bring your bike back for scrutineering only after you have fitted the lower fairing” did nothing to build up our confidence! 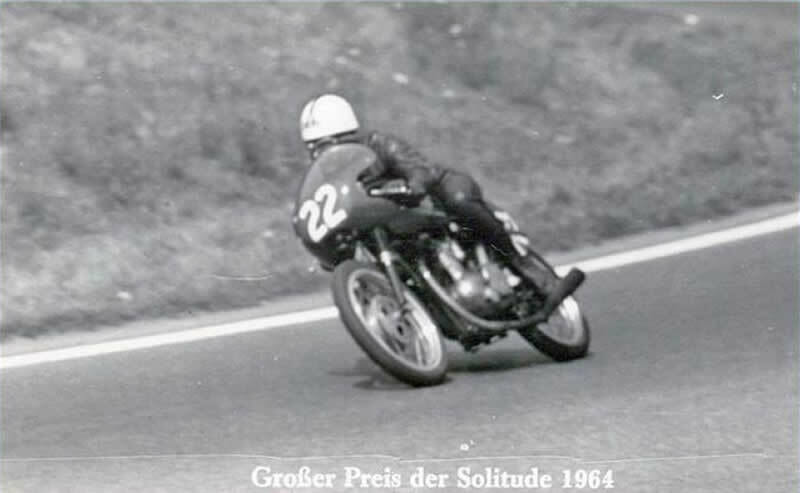 In the introduction to the report of the 1964 West German Grand Prix on the Solitude-Memorial web site, www.solitude-memorial/d , is the statement “Never before and never again would there be a Grand Prix meeting at which so many current and past World Champions would compete against each other” If I had known this was to be the case, I doubt if I would have had the nerve to enter this meeting! Riding onto the magnificent Solitude circuit for the first time, I was somewhat apprehensive but determined to make the most of things as I set off on the 125. I soon discovered just how fast the Works Honda, Yamaha and Suzuki,s really were in comparison with my Parilla. Even the MZ,s and Bultacos were going faster than I had ever seen them go before. Hugh Anderson, Redman, Read, Frank Perris and many others must have been passing me with a top speed advantage of 40 MPH or more! With such a speed deficiency, the only thing I could do was to try to get a tow when a Bultaco or some other not so quick machine went past and ride my socks off through the bends and slower curves. Trying too hard I overdid things on a number of occasions and had to take some very unconventional lines to avoid running into the back of some riders under braking! Vic Watton my mechanic, an optimist by nature, looked grim when I returned to the paddock and I must have had a face to match once I saw the practice times! Hugh Andersen and the top 6 riders were already lapping at around 4.45.00 (averaging 96 mph) compared with my best lap at 5.45.00. (say 68 mph)! At this rate with only the fastest 30 riders from 52 entrants being permitted to start, it was very clear I would not succeed in qualify in this class! My first 250 practice session was a little better when lapping at around 5.26.00 per lap, but this was still some 54 seconds slower than Phil Read, Agostini, Redman, Provini, Schneider and the other front runners in this class. This time with 58 entrants, my improved times would still not get me into the top 30 starters — almost time to panic! With only one more chance to qualify in each class the following morning, I turned in early but not before going over and over again, all of the things I could possibly do to make the Parillas quicker and for me to ride faster. With all this on my mind and with the volume of music from within the paddock and the surrounding countryside from over 30,000 spectators already camped out in the woods, I did not get much sleep in our Ford Thames that night. Between practices, Vic and I were busy preparing the bikes which for me included 3 trips to the Dunlop service truck for new tyres to be fitted and wheels balanced all round. At the beginning of the season I had done a deal at Fort Dunlop Birmingham, when Dunlop agreed to supply me with 6 sets of their latest soft compound triangular racing tyres to start the season and to supply me with more tyres at all of the World Championship and other International meetings which they would be supporting. On my arrival at the Dunlop truck the bikes still had on the original tyres with which we had started the season, they showed very little wear and this somewhat surprised the Dunlop technicians. After fitting the new tyres and carefully inspecting the old, the technicians recommended that I should reduce the tyre pressures by 2 lbs down to 26 & 27lbs, front and back. I wondered later if it was just this small change to tyre pressures which helped me reduce my lap times next time out? The final practice sessions came all too soon but this was it! The 250 session was the first of the day and I now knew that I had to get down to below 5.20.00 to stand any chance of qualifying. I had noticed earlier that at two parts of the track some slower riders were holding back and waiting for the faster riders to come through and they would then try to get a tow down the next straight. My first attempt at this resulted in me following Ernst Weiss on his Cotton but this was not much help as Ernst, surprisingly quick on the straights, was holding me up in the curves. Thinking I had lost any chance of gaining a tow when I was half way around my final practice lap, a very quick ex works Sportmax NSU passed me as we entered a series of high speed curves and esses before the last straight, this time I was just able to stay with this NSU until near the end of the lap when I pulled out of his slipstream and rode alongside him just as we crossed the finishing line. I would have liked to have stayed with the NSU for one more lap but I knew I was getting low on fuel and I did not want to chance blowing my engine. Having reached 9,400 rpm behind the NSU down the back straight I had encountered valve float for the first time! It was clear from the smile on Vic’s face when I returned to the paddock that he thought I had done enough to qualify but we had an anxious wait until the final official practice times were published and displayed in the paddock. At last the results went up and I was in, being listed as the 25th rider to qualify and down to start in the middle of the 5th row of the grid in the afternoons Grand Prix. This was undoubtedly one of the proudest moments of my life. With the 350, 500 and sidecars final practice sessions following my 250 practice session, before I was due to go out again for the final 125 session, Vic immediately started checking over my 250 when to our surprise he discovered the spokes in the front wheel were loose! Fortunately he did not start tightening them up straight away as 30 minutes later we found they had tightened themselves once the brake drum had cooled down, but then he did give each spoke just a quarter turn. It did not come as a surprise when the official lap times were posted to find that I had not qualified the 125. This was the very first and fortunately the last time I would not qualify a Parilla to start in a World Championship Grand Prix or any other International race. Two hours later I was on the grid for the start of the 250 Grand Prix when, being on the 5th row, I got the full blast from the exhausts of some of the most exotic motorcycles in the World as we all formed up for the start. Back on the starting grid and now with dead engines, I could just see Ginger Malloy on his Works Bultaco two rows in front of me. In front of Ginger on the 2nd row was Taveri and Bruce Beal on Works Hondas and just in front of them on the front row, Jim Redman on another Works Honda. The question now on my mind was just how many of these guys could I jump at the start and keep behind me until the first turn, for a brief moment of glory? With everything now still and in complete silence my adrenaline pump must have been working overtime during the seconds leading up to the start when with a surge of inner strength I bump started the bike in only 3 strides and managed to jump most, if not all, of the riders on the fifth and forth rows and then sat on Ginger’s back wheel for all of three to four hundred yards. Nobody passed me through the bends on the first lap but on the straights it was another story. After the first bend Ginger broke my tow and along with 5 or 6 other riders disappeared at a fast rate of knots into the distance, he and his group were completely out of sight by the time I had completed my first lap. Now riding at the back of the field with a group of 4 or 5 bikes with similar performances to my Parilla, I worked away at trying to lead the group as often as possible when on the start of the second lap I got my first pit signal indicating 22nd place. This encouraged me to keep trying as did the signals on the subsequent laps when I seemed to be gaining one or two positions on each lap without overtaking anyone! All was going well until the 8th or 9th lap when, without any warning, my engine just stopped and I coasted to the side of the circuit within sight of the last bend and the finishing line. Looking over the bike I could not see any problem and pushing the bike back on compression I could see that it was not a repeat of the problem I had with the cam drive chain sprocket at Albi. I checked the fuel and the spark but could not find any problem. Shortly after this I watched Phil Read sweep through to take the win on his Yamaha closely followed by Jim Redman, Honda and Mike Duff, also on a Yamaha. Seeing that there were less than 20 riders finishing and now with a clear track,I tried to get my bike started again when to my surprise it fired up at the first bump! I then got back on track and crossed the finishing line in the forlorn hope that I might at least get a finishers award, but no such luck. Riding back to the paddock I noticed a slight vibration coming from the engine and there was a distinct ‘ping’ as I shut the engine down! Any hope that Vic and I might have had of going off to celebrate other riders successes was now definitely gone and we immediately set to stripping down the 250 engine. In just over an hour Vic, who did most of the work, had the engine stripped down to the stage we discovered the big end bearing had gone. We could not find however any explanation for why the engine had stopped during the race, this was forever to remain a mystery. A big end failure when we were not carrying a spare crankshaft assembly was very worrying as we were down to ride in the East German Grand Prix at the Sachsenring the following weekend and the Ulster G. P in Northern Ireland, in all 3 classes, only 2 weeks later! Whilst I went off for a shower and a change of clothing, Vic started to remove the bottom half of the 250 engine from the frame. Upon my return I found Vic had been joined by a young German who had parked close to us and had earlier shown an interest in the Parillas, he was explaining to Vic (in very good English) that he had a good contact in a local precision engineering company which he claimed could undertake the manufacture of any racing motorcycle big end assembly. Meeting up with Albert (Bert) in the paddock turned out to be a real stroke of luck.Bert was also a racer and the proud owner of 2 Manx Nortons but he was not riding at Solitude. He agreed to come back to the circuit on the Monday morning to take us to see the company he was recommending. With no more racing for us, Vic and I spent much of Sunday watching the 350 and 500 class races and were most impressed with the performances of privateers Vernon Cottle and Derek Woodman, who were 5th and 6th on their AJS in the 350 race and Morrie Low, (Norton) Fred Steven’s and Lewis Young, both on G 50 Matchless, who were 5th, 6th and 9th in the 500 race, won by Mike Hailwood on the MV. First thing on Monday morning Bert arrived as promised and took us to the precision engineering company he had mentioned earlier. Approximately one hours drive from Solitude the company turned out to be a subsidiary or affiliate of Heinkel, the aircraft & general engineering manufacturer. To our surprise we were immediately led on arrival through some impressive offices to the Company boardroom. Here we were soon joined and welcomed by two Directors – Bert clearly had some influence here! Discussing the problems regarding the big end and our need to get to the Sachsenring within 3 days over coffee, the Directors summoned the Chief Engineer, who it soon became clear, was a big motorcycle racing fan. The Chief took me to a very smart and crystal clean Workshop whilst Vic and Bert went off to collect the 250 engine bottom end.… We had not split the crank cases at this stage thinking it would be better to do this in a clean Workshop rather than in the dusty race paddock. When Vic arrived back with the engine I informed the Chief that we had all our tools with us and were ready to start splitting the crank cases but he would not hear of it, with a laugh he told us he would have problems with the Unions if his staff saw us working in his workshop. His last words were “leave it to us and come back to see how we are getting on in the morning at 11 o’clock” Leaving a complete set of both gearbox and engine bearings and seals with the Chief, we spent the rest of the day on a guided tour of Augsberg ending up at Karl’s home where his parents made us most welcome. Bert’s parents’ house, in an affluent district of Augsburg, had an extremely steep drive down into the entrance of the garage and workshop under the house in which Bert kept his Nortons and I was left wondering how they got their cars out of there in the Winter, particularly after it had snowed? Having been treated to freshly baked home made scones with jam and cream by Bert’s mother, we left Augsburg and returned to the now almost deserted Solitude circuit paddock. Back at the factory at 11 o’clock the following morning, a security guard from the main gate accompanied us directly to the workshop where we had left the engine with the Chief Engineer. There was nobody in the workshop when we arrived and to my horror, I could see the engine was still on the bench in a plastic crate just as we had left it! Walking closer I could at last, see that someone had given the engine a good clean and had even polished the piston which now looked almost new? Just as it was beginning to dawn on us that all the work had already been completed, in walked the Chief with a big smile asking if it all looked ok. The Chief gave us a small plastic bag with the remnants of the old crank pin, broken cage and roller bearings and he explained that having found the conrod bigend eye scared but otherwise ok, they had removed the scaring by increasing the bore of the rod by approximately .006.” This required a new .006″ oversize pin to be manufactured which they did. They were still able to use a standard INA (higher spec than the original Parilla unit) cage and rollers. All this in 24 hours! Bert had earlier warned us that any work undertaken by the Company would not be cheap and it was indeed fortunate that we had done well financially at Luneville before our arrival at Solitude as the final bill eliminated a good part of the funds we had built-up in the toolbox! With the 3 bikes now all serviceable and with two World Championship meetings in front of us, the high cost of the repair to our 250 engine was, in our minds, insignificant at the time and we just could not thank the Chief and Bert enough before setting off for our next challenge, the Sachsenring, in East Germany. 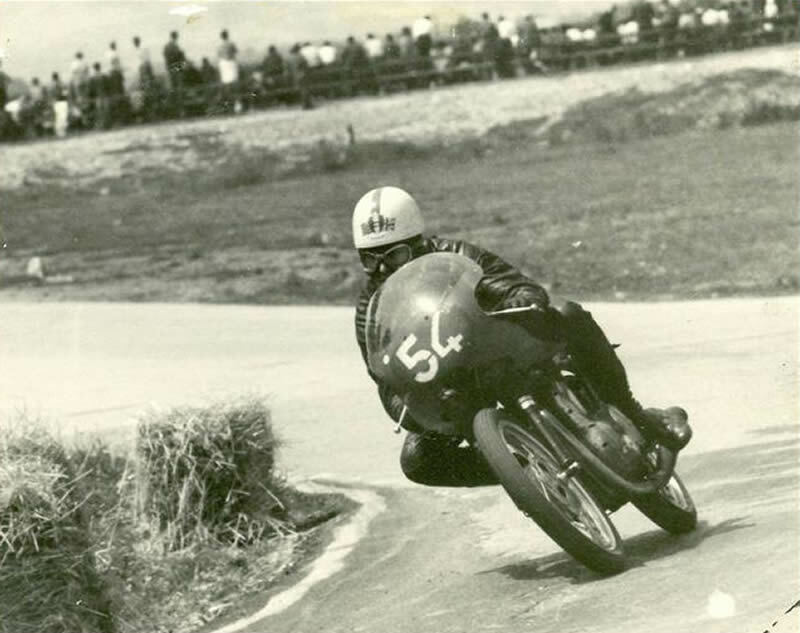 Albert Achinger, aged 24, was killed on the 30th August 1964, riding his 500 cc Manx Norton at a race on the AVUS circuit in West Berlin. We trod the same path for only a day but our memory of him will never go away.